Low Carb on the Go makes fitting a low-carb diet into your busy day as easy as possible with more than 80 recipes modern, vegetable, and protein-packed recipes such as chia seed and turmeric pudding, coconut and vanilla energy balls, and chicken teriyaki with cauliflower rice. Discover tips and tricks for healthy meal prep, and the best way to store and transport your low-carb lunch to keep it tasting fresh. Each recipe contains nutritional information, including the all-important carb count, as well as a handy guide to the prep time and equipment you'll need. A super simple, no-bake power snack from DK’s Low Carb on the Go. 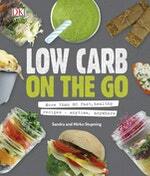 Love Low Carb On The Go? Subscribe to Read More to find out about similar books.